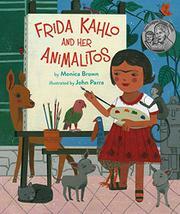 Frida Kahlo’s strong affection for and identification with animals form the lens through which readers view her life and work in this picture-book biography. Each two-page spread introduces one or more of her pets, comparing her characteristics to theirs and adding biographical details. Confusingly for young readers, the beginning pages reference pets she owned as an adult, yet the illustrations and events referred to come from earlier in her life. Bonito the parrot perches in a tree overlooking young Frida and her family in her childhood home and pops up again later, just before the first mention of Diego Rivera. Granizo, the fawn, another pet from her adult years, is pictured beside a young Frida and her father along with a description of “her life as a little girl.” The author’s note adds important details about Kahlo’s life and her significance as an artist, as well as recommending specific paintings that feature her beloved animals. Expressive acrylic paintings expertly evoke Kahlo’s style and color palette. While young animal lovers will identify with her attachment to her pets and may enjoy learning about the Aztec origins of her Xolo dogs and the meaning of turkeys in ancient Mexico, the book may be of most interest to those who already have an interest in Kahlo’s life.